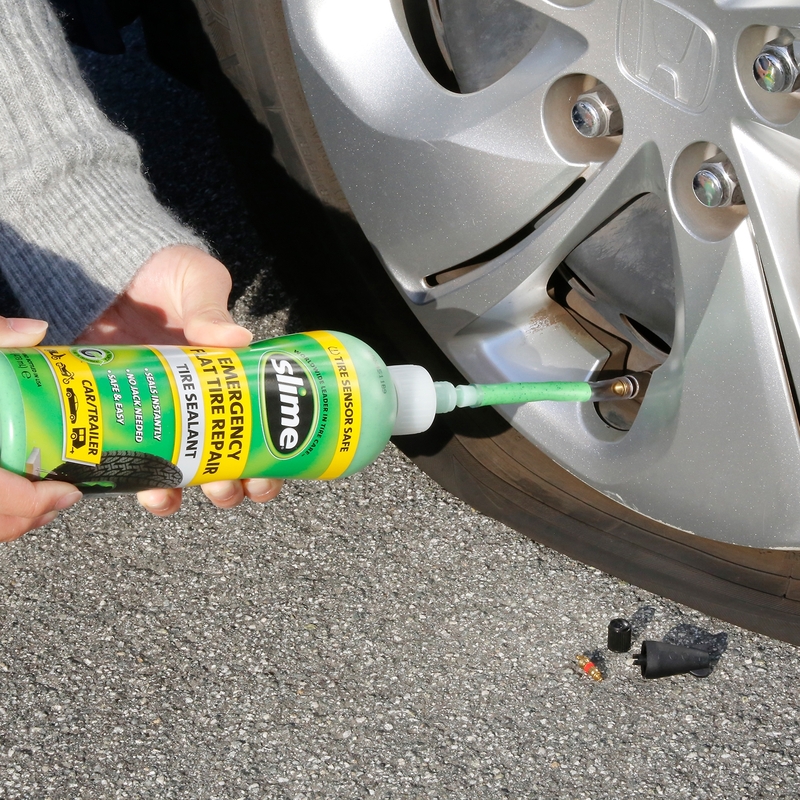 You’ve reached for the bottle to fix or prevent flat tires – smart choice! Whether this is an emergency repair (yellow label bottle), or you are preventing flats for up to 2 years (red or blue label bottle), the Slime installation process is the same. 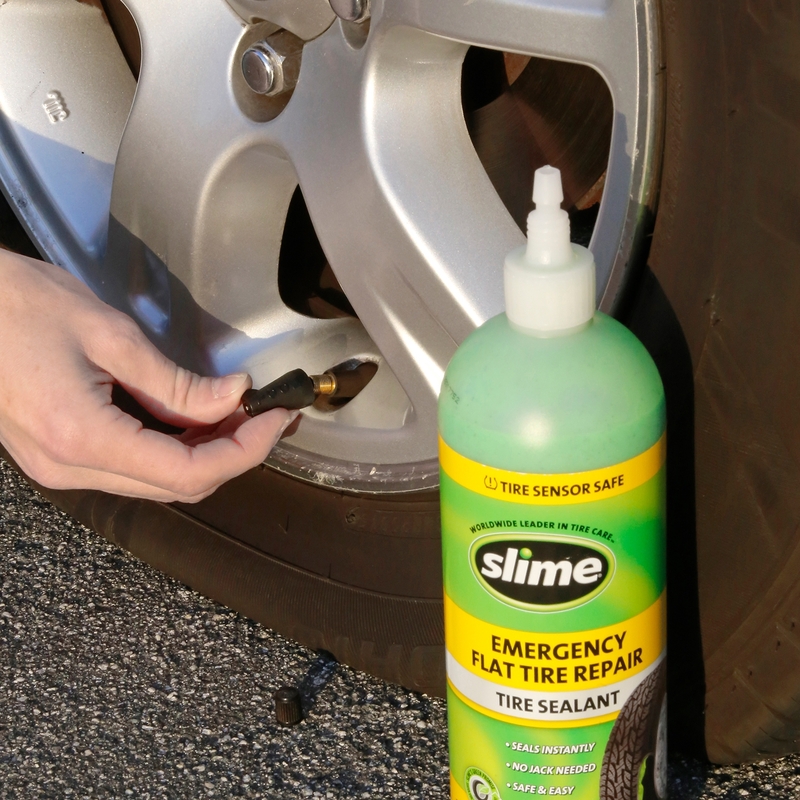 Slime can be inserted with the valve stem located in any position, but it works best if you position the valve stem so it sits in the upper half of the tire. Take the valve cap off your valve stem. When you look inside the top of the tire valve stem, you will see a metal cylinder in the very center. This is the valve core and it needs to be removed in order to install Slime. 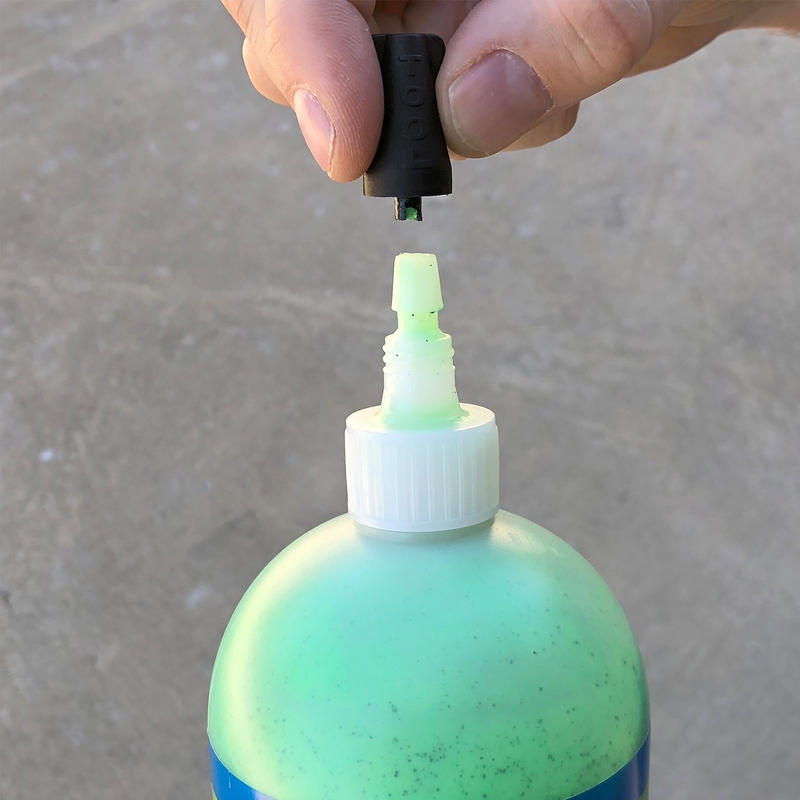 The black cap on your bottle of Slime is a valve core removal tool. 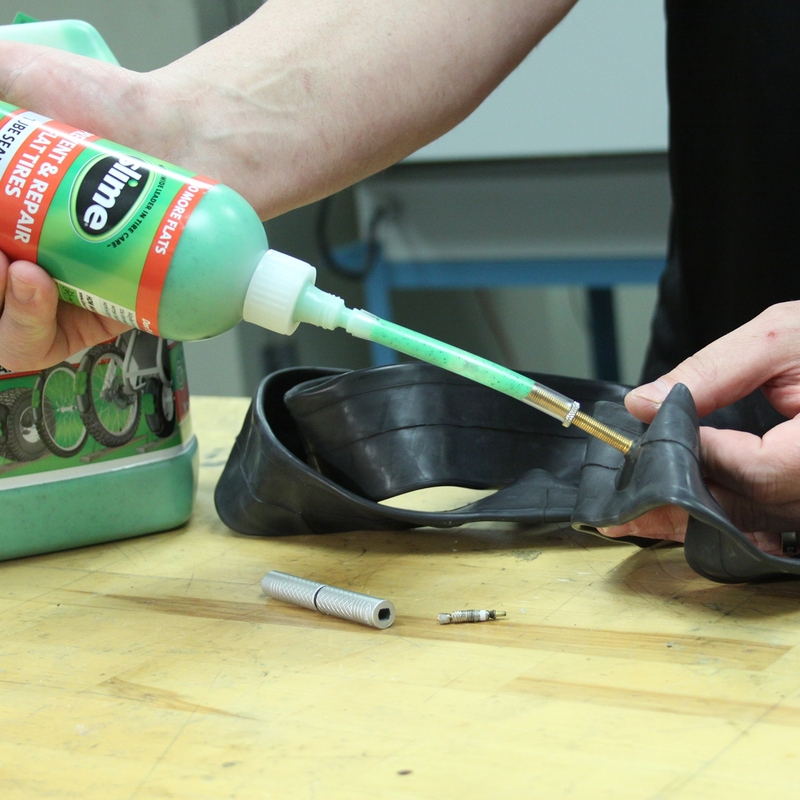 Twist it off the bottle and use the knobby tool in the center to engage the valve core. Slowly twist the tool counter-clockwise to remove your valve core. You will know you are successfully removing the valve core when air starts hissing out of your tire. 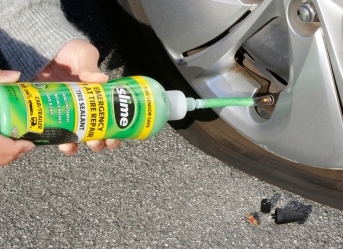 Your tire must be as flat as possible to inject the Slime. Allow the air to slowly escape from the tire and set aside the valve core (you will need this piece again later). 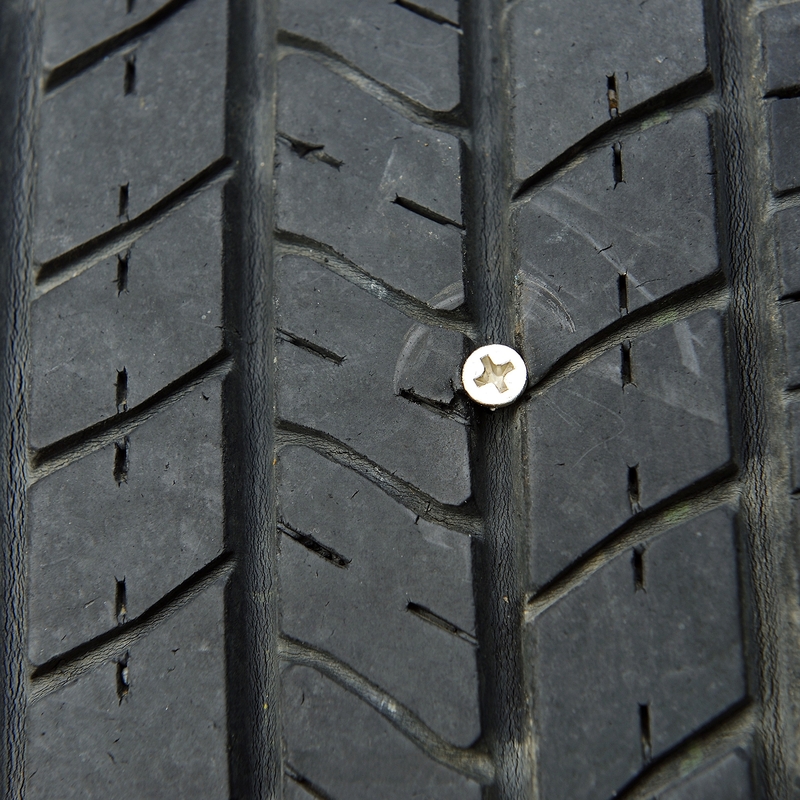 Locate the screw, nail or other offending object that caused your tire to go flat. If possible, remove it from the tire. Unscrew the white cap from the top of the bottle, peel off the white seal and then re-attach the white cap. Remove the clear tube from side of the bottle and attach one side to the top of the white bottle cap. 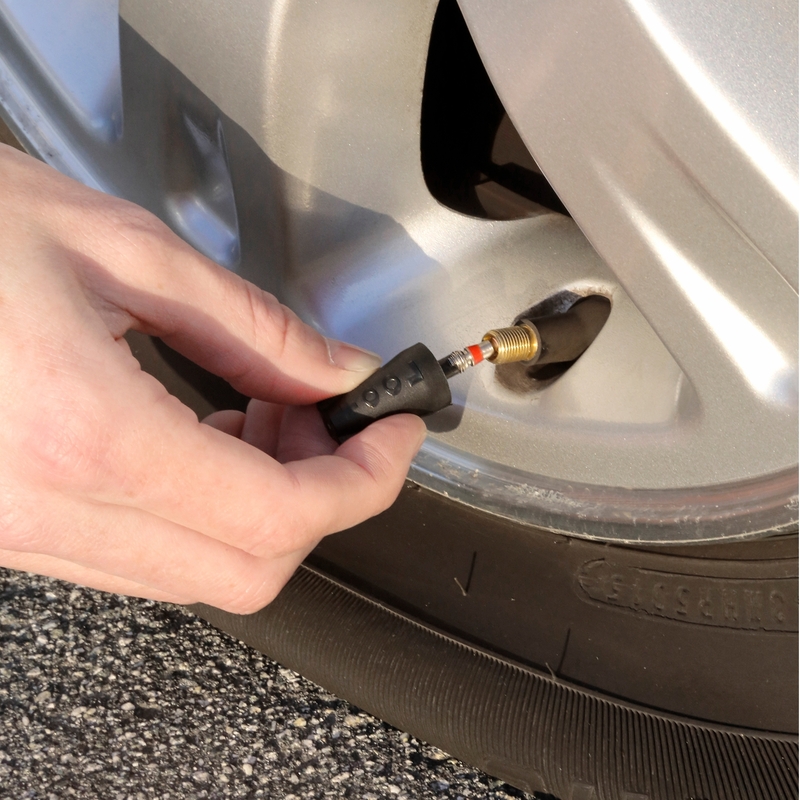 Attach the other side to the valve stem on your tire. Squeeze in the appropriate amount of Slime. You can use the chart on the back of your bottle to determine how much Slime you need, or you can use our Slime calculator. 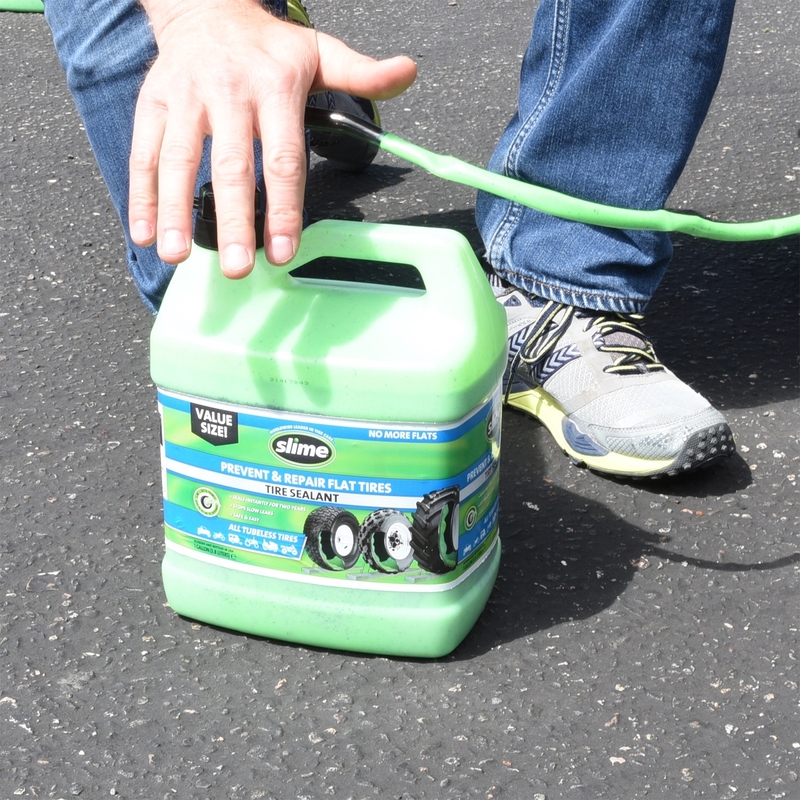 If you are using the gallon product of Slime, then one pump equals approximately 1 oz of Slime. 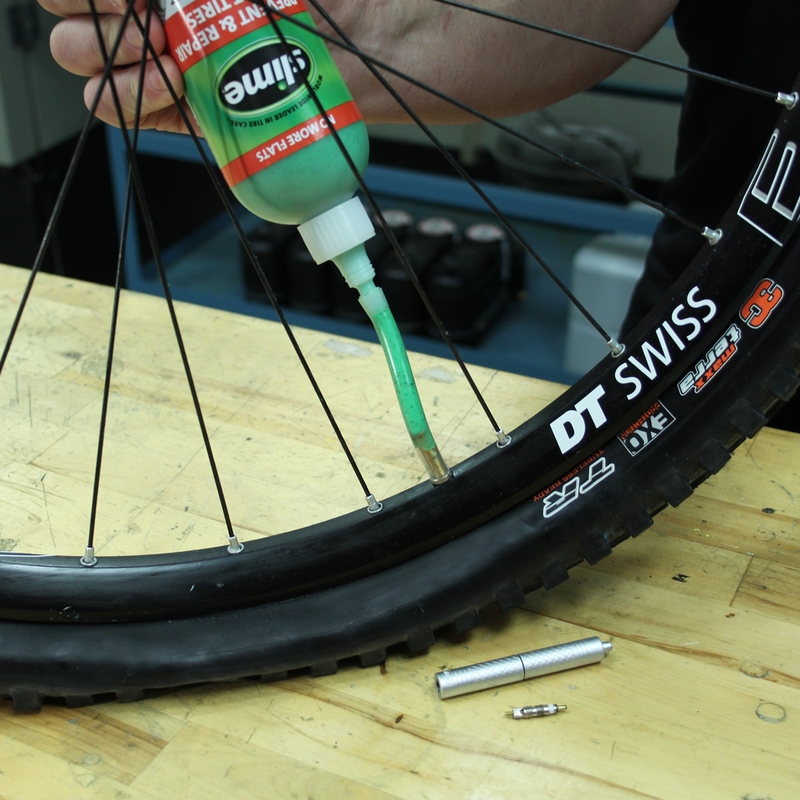 If your tire has tubes (like on a bicycle or dirt bike), you can inject the sealant directly into the tube before inserting the tube into the wheel, or you can inject the sealant into a tube that is already pre-installed into the wheel. Remember that little valve core you removed in Step 2? Time to put it back in! Using the same black tool from the cap of the bottle, screw the valve core back into the valve stem by turning clockwise until tight. If any Slime has oozed out while installing the valve core, simply wipe away with a cloth. 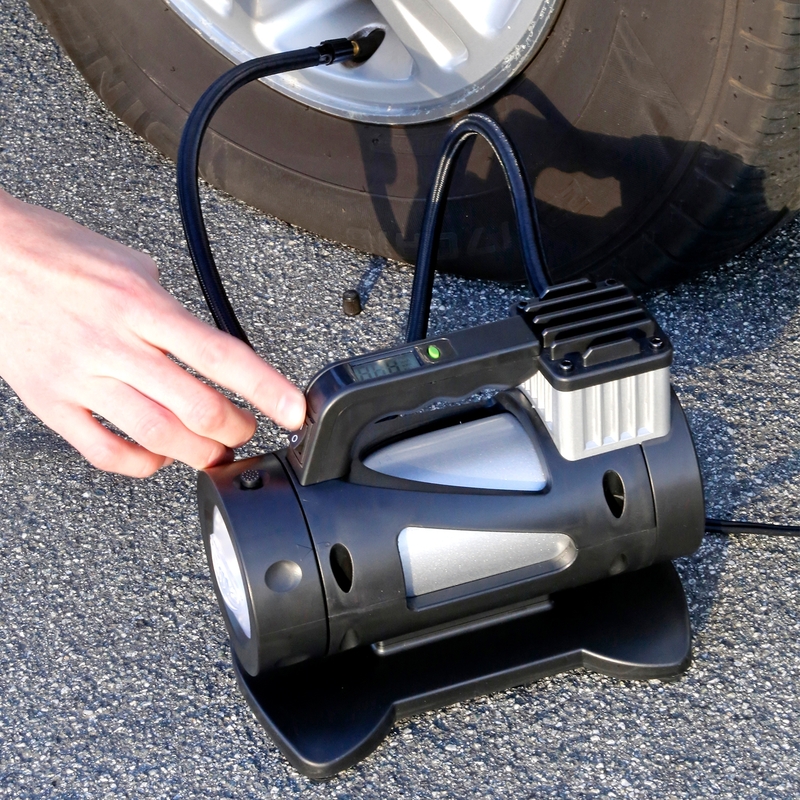 Using your favorite tire inflator, air up the tire to the manufacturer’s recommended air pressure. You can find this measurement on a label typically located on the inside door jamb of the driver or passenger seat. 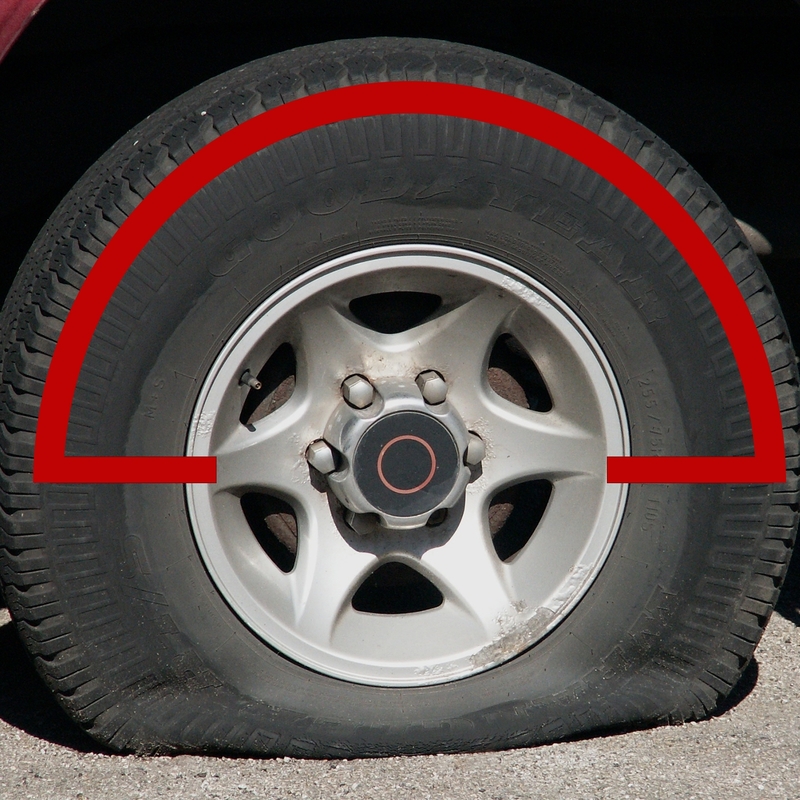 To properly spread the sealant around the inside of your tire, drive approximately 0.2 miles, then stop and verify that the sealant plugged your puncture and that the tire is holding air pressure. 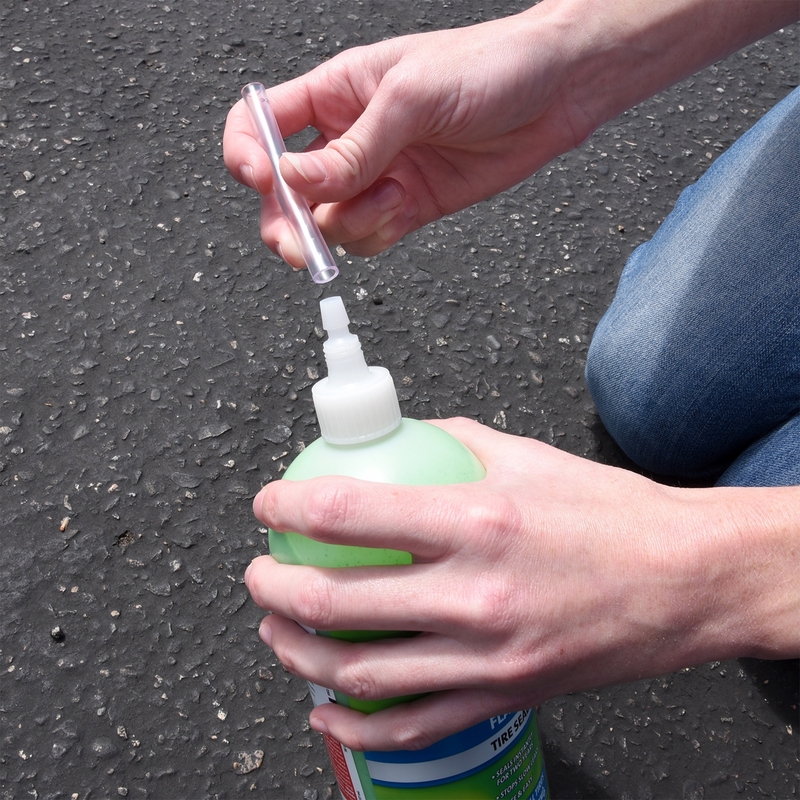 If you are installing Slime in a bicycle, simply spin the tire to evenly distribute the sealant. Congratulations! You have successfully installed Slime and repaired your flat tire. If you installed the yellow label Emergency Tire Sealant formula, then please seek a professional repair within 3 days or 100 miles. вполне достаточно посетить чтоб уточнить http://pp-budpostach.com.ua/a141927-kak-uteplit-skvazhinu.html что делать если замерз колодец на даче\r\n и отыскать остальную полезную информацию, самую свежую и исчерпывающую. Отличный и надежный фото хостинг без назойливой всплывающей рекламы, \r\nВаши фото не будут удалены! \r\nБезлимитный фотохостинг! Codziennie miliony uzytkowników komputerów przypadkowo surfujac w internecie spozywaja doklejonego czesto do sciaganego programu wirusa z grupy koni trojanskich oraz infekuja swoje istotne urzadzenia dajace dostep do internetu i sieci w domu. Konie trojanskie i ich zlosliwy kod sa uzywane do atakowania platform mobilnych, a takze komputerów osobistych. Na przyklad Twój smartfon moze zostac zainfekowany przez sciagniecie prostej aplikacji z Google Put on, Apple lub podobnych zródel. http://wls-surgery.com - Trust Pharmacy - World Famous Pharmacy!